When she was in high school, Colleen Flores would question police officers while they filled out their reports at the restaurant where she worked. Now, close to three decades later, Flores is the city of La Verne’s newest police captain, and the first woman to hold the title in this city. Kelly Flores, Colleen Flores’ daughter, pinned her captain’s badge to her uniform during a ceremony in the La Verne City Council Chambers Jan. 16. Her first day on the job with the LVPD was Jan. 7, just a few days after her last day at the Arcadia Police Department on Jan. 3. Flores was selected from a pool of seven applicants. The pool was narrowed to three candidates, who then went through written, practical and situational testing. Paz said it was Flores’ extensive experience and training that led him to her selection. Robert Russi, La Verne city manager, said that LVPD is light on experienced leadership due to recent retirements. Capt. Flores’ appointment helped fill that deficit, he said. “I believe that she can bring up the caliber of the experience of those in the department and also help mentor them,” Russi said. Flores decided to pursue the captain position in her home city of La Verne after hearing about the posting in Arcadia, where she had served as an officer since 1995. Flores said it was the professionalism and reputation of the LVPD in the surrounding communities that piqued her interest. Her final nine years with Arcadia were as a lieutenant. As a captain, Flores will be responsible for many programs within the department, including the Uniformed Patrol Division, Traffic Enforcement Bureau, Reserve Forces Bureau, Training Bureau and the Foothill Special Enforcement Team, or FSET. FSET is a combined force of Glendora, Monrovia and La Verne police departments that focuses on high risk operations in any of three cities. Flores’ interest in policing began when she was just 15 years old and working as a hostess at a local restaurant, where officers would come write up incident reports. “I was inquisitive, probably somewhat obnoxious,” Flores said. The officers would explain the process each time she asked. Flores went on to serve as an explorer, a volunteer under the age of 18, for the Upland Police Department for four years. An explorer typically handles office and secretarial duties as a way for youth to explore the possibility of law enforcement as a career. LVPD currently has 11 explorers. Flores then served as a cadet for one year in 1994 for the Chino Police Department before being sworn into service at Arcadia. 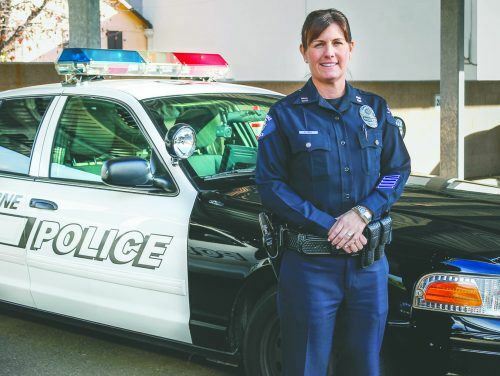 Ten years into her career as an officer, Flores received a bachelor’s degree in business management from the University of Phoenix and a master’s in organizational leadership at Woodbury University. She has also completed Peace Officer Standards and Training, or POST, Command College. There are only two classes per year, each accepting a limited number of 24 candidates from all across California. Flores said that POST Command College was more detailed and comprehensive than her master’s program. The curriculum focused on adaptive decision making, a popular concept in the military. It answered questions on how to deal with issues that law enforcement will face in the future including the threat of drones and the impact that self-driving cars will have on highway patrol. Flores now hopes to utilize her training and experience in the La Verne community, including the University of La Verne campus. Flores plans to reach out to University of La Verne leadership to further develop plans in the event of any active shooter and bomb threats, while giving full respect to the University’s leadership and personnel as they seek to work on their safety programs. The LVPD has already developed contingency plans with neighboring public schools and ULV in the event of active terrorist threats. “I am looking forward to working with Capt. Flores,” said Clive Houston-Brown, vice president of human resources, information technology, facilities and safety. On Jan. 27, LVPD Lt. Sam Gonzalez said he had met with newly appointed Senior Director of University Safety Operations, Shirley Smith, to speak about campus safety issues. LVPD also works with the ULV to educate new students in Safety Orientation Meetings when requested by university leadership.